‘What makes this controversial is the age and location of the prints,’ says Professor Per Ahlberg at Uppsala University, one of the authors on the new study. Studies in recent decades have led to the conclusion that all fossil human-ancestors older than 1.8 million years lived and evolved in Africa. The new fossil footprints are not the oldest hominin evidence to be found, but they could drive a wedge in the timeline of evolution. It’s thought that human ancestors of the last few million years directly derived from a genus known as Ardipithecus. And, as a set of ‘reasonably complete’ 4.4 million-year-old Ardipithecus ramidus fossils discovered in Ethiopia was found to have an ape-like foot, it was thought that the human-like foot had not yet evolved by that time. 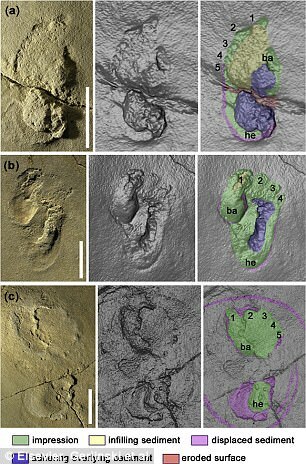 Several other fossil discoveries in South and East Africa have further supported the idea that the evolution of human bipedalism took place on the continent, including the 3.7 million-year-old Laetoli footprints from Tanzania, which provide evidence of human-like feet and upright locomotion. The prints were found in a type of sedimentary rock that formed when the Mediterranean Sea briefly dried out, 5.6 million years ago. This knowledge, coupled with dating methods based on marine microfossils, indicates that the prints are about 5.7 million years old. The shape of the fossil prints suggests the suspected hominin who left them was more primitive than the Laetoli, whose 3.7 million-year-old prints found in Tanzania gave evidence of human-like feet and upright locomotion. The new footprint is proportionately shorter, though it shares the same general form. While the Trachilos prints were created on the sandy shore of the Mediterranean, the Laetoli tracks were made in volcanic ash. The researchers now say that during this time, before modern day Crete detached from the Greek mainland or the Sahara Desert even existed, early hominins could have lived across southeast Europe as well as Africa. 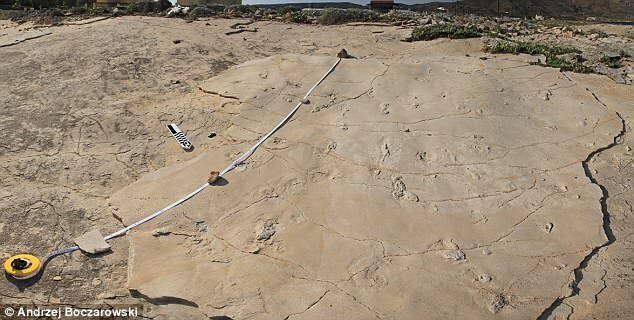 ‘The interpretation of these footprints is potentially controversial,’ the authors wrote in the study, published to the journal Proceedings of the Geologists’ Association. The shape of the fossil prints suggests the suspected hominin who left them was more primitive than the Laetoli. The foot is proportionately shorter, though it shares the same general form. ‘This discovery challenges the established narrative of early human evolution head-on and is likely to generate a lot of debate,’ said Per Ahlberg.